Practitioners can now use electric motors by simply connecting iOptima to their existing dental unit. For an astonishingly small outlay, they can equip their practice with the performance of electric technology and enjoy the range of benefits it brings. Treating a larger number of patients has direct consequences on the profitability. The functionalities of the iOptima application and the performance of Bien-Air electric instruments combine to drastically reduce the time taken for your procedures. Equipped with the most advanced technology ever developed, the iOptima is simple, efficient and risk-free. Restorative and endodontic procedures can be pre-programmed. Simply indicate the type of procedure and select tools from the best-known manufacturers to access parameters such as the contra-angle, speed, torque and direction of rotation. Unlike other systems available on the market, iOptima is upgradeable: new functions are regularly added to it. This means that the performance and possibilities offered by your iOptima are improved each time you update the application on your iPod. Free of charge. Simply download the iOptima application, connect the system to existing 4-hole tubing and you are ready to go. Your air-driven hose will be transformed into a formidable electric system in an instant. The Apple user interface is ergonomic and extremely intuitive. It makes the system extraordinarily easy to use. 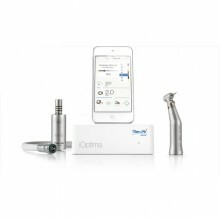 The iOptima application for iPod touch, developed by Bien-Air Dental, offers numerous pre-programmed options. Designed and developed to meet the needs of all practitioners in any situation, the iOptima offers a choice between using pre-programmed options and customizing each parameter, either before or during procedures. The iOptima allows practitioners to program custom settings from A to Z and to modify them at any time. 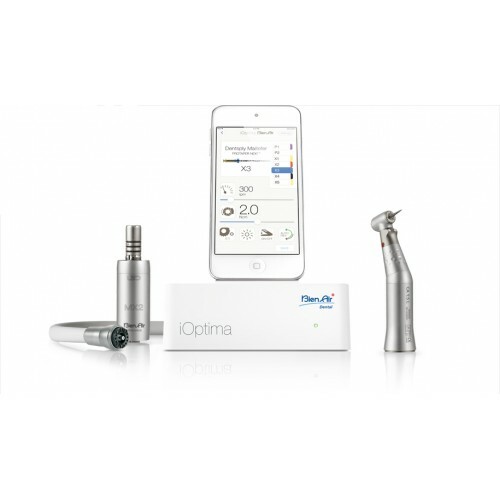 In addition, the Auto-reverse and Auto-forward functions for the iOptima application mean that you can carry out endodontic treatments in complete safety. The iOptima comes with the Bien-Air MX2 LED micromotor, which offers the best performance on the market. The micromotor's SMART LOGIC electronic management system automatically controls the power and compensates immediately for any variations in pressure on the tool. The MX2-LED simplifies and optimizes restorative, prophylactic and endodontic procedure. It also comes with a 3-year warranty. The MX2 micromotor and Micro-Series contra-angle combination significantly reduces hand fatigue - thanks to perfect balance and a reduction in size. MX2 and Micro-Series is the world’s smallest electric handpiece. Click the button below to add the Bien-Air iOptima Motor Set to your wish list.